You don't have to be crawling through the undergrowth to appreciate the TRT 22 Pack from Jack Wolfskin–but you can if you want to! This functional day pack performs just as well in the urban jungle as it does on a hiking trip through the woods. TRT stands for 'tough, rough, technical'. The TRT 22's modular gear loop system is a particularly clever feature. The gear loops are partially concealed behind the slatted panels on the front of the pack and can be pulled out when needed. Each loop also functions as a reflector. So even when they're tucked away you'll still be visible in the evening traffic. The shoulder straps on the TRT 22 can also be concealed. You can stow them away behind the back padding and carry the pack by the handle, just like a suitcase. 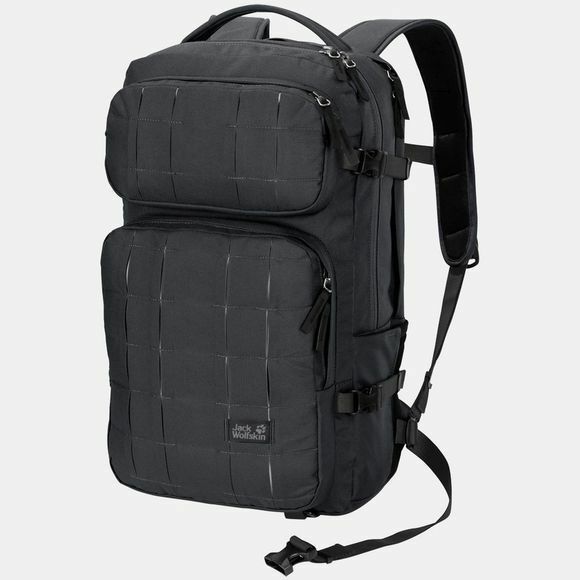 The pack has a main compartment, a laptop compartment (14") and a wet laundry compartment, plus two elasticated side pockets–better than your average day pack. One of the two front compartments is lined in fleece–for your eyewear or other fragile objects. Another cool feature is the detachable key tape with bottle opener.